Pets are family and to make your furry best friend feel extra special and comfortable, you need to buy the best products for them. Here’s us showing our love to all pets with our pick of pet stores in Bangalore. Glenands is probably your go-to brands for all kinds of pet feed including dog biscuits. The Glenands stores in Bangalore also offer a range of products including leashes, beds, brushes and basically anything your doggo or kitty might need. Oh, and their exclusive pet grooming centre in Indiranagar is perfect for giving your pet the royal treatment. They also have products for hamsters, birds and even turtles. Heads Up For Tails wins for their huge collection of products for dogs, cats, birds, and even fish. With over 95+ brands in their store, it's only natural that you will spoil your pet for the best. they have toys to leashes and you can even personalise the products as a one of a kind leash, name tag or a bed! Check out their stores in Indiranagar, Ashok Nagar and Koramangala that features a spa too. Apart from cats and dogs, if your pet is a guinea pig, hamster, rabbit, or even bird, rest assured DogMyCats will have everything that you need for your pet's care and happiness. From food to grooming essentials, you will love their range of travel accessories that you can consider investing in if you like to take your pet with you during vacations. Since they have delivery channels all across the city, there's guaranteed same-day delivery on orders before noon. Ella's Petscape is a doggy parent's dream come true with their space hosting a play area, a lounge for you to chill while your pooch gets the royal treatment at the grooming centre. Oh, and did we tell you that once your pooch is done with the spa session, you can head to the cafe and have a doggy date? Don't let the name fool you, Just Dogs in Koramangala will take care of cat needs too, right from conception, to grooming and boarding needs later in life. Pretty cool, right? The experience centre has aisles of products both from Indian and international brands and they’ve got everything from pet food to clothing and age-specific toys to help your little buddy. Apart from the shopping, Just Dogs also offers pet services like pet boarding, spa for both dogs and cats. The pet store has a clinic, grooming centre and, animal behaviour specialist, making it your one-stop shop for all of your furbaby’s (feline or canine) requirements! They stock medication, pet food, accessories and toys for pets. Oh and the cute jumpers and t-shirts for dogs of all sizes will steal your heart and make you want to buy them all! An online pet store, House Of Paws is the cutest for pup parents and their doggy dearest. They stock up on all things that your dog will love. Think cuddly toys, chew toys, and even a belly rub box. 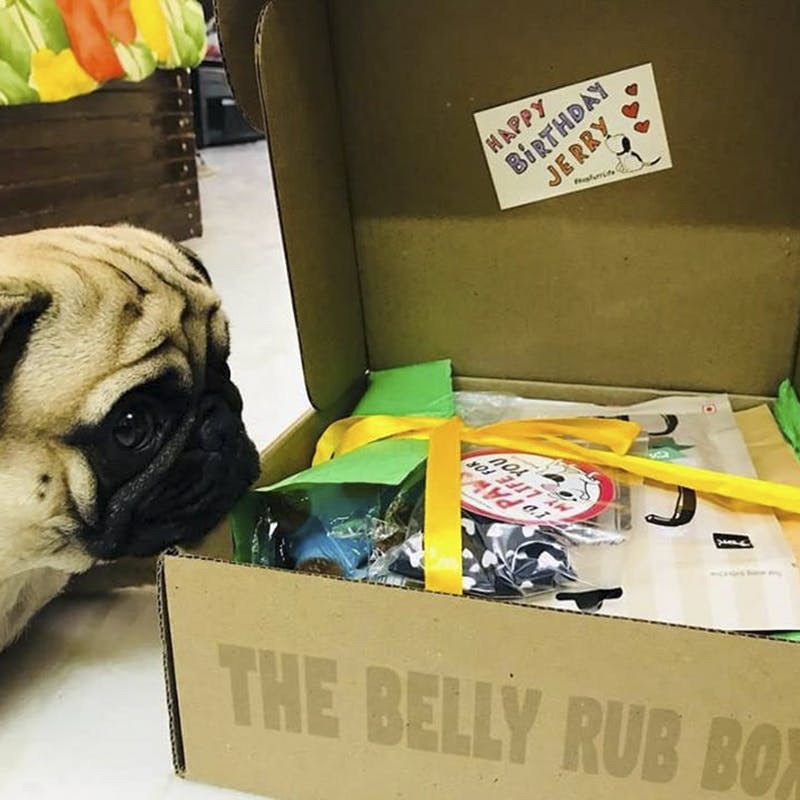 The belly rub box is a customised and curated surprise box that includes goodies and snacks for your dog. Think of it as a subscription box that you can opt for every month!